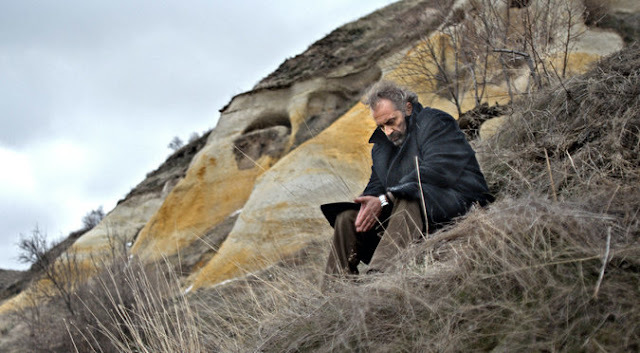 A lyrical masterpiece from the cinematic mind of Nuri Bilge Ceylan, it will be easy and unfortunately understandable if a film like Winter Sleep doesn't achieve the recognition and level of appreciation it deserves. At first glance, I would expect most to avoid a work like this merely based on it's 196 minute length and the fact that it is a Turkish film with subtitles, but please don't. If I can convince even just one person to find the time and have the patience to digest this achievement, it will be a victory in my book. Winter Sleep is easily one of the finest efforts of 2014. First, let me get this out of the way: The LEGO Movie is no longer the biggest, most confounding exclusion from the Academy Award nominations. If it were up to me, Winter Sleep would not only be nominated for the Best Foreign Feature, it would be the clear cut winner, yet despite winning the Palme d'Or at the Cannes Film Festival a year ago somehow this was overlooked by the Academy. Last year anonymous voting members admitted that they didn't want to watch the masterful 12 Years a Slave because heaven forbid they have to tap into their white guilt, as if two hours of their time was as difficult of an experience as the lives of those depicted in that film. While 12 Years a Slave and Winter Sleep aren't even remotely comparable films, I bring this up to make a bigger point: it's a shameful thing that those who are asked to award recognition to the most worthy movies from a year don't like to be challenged. I can only assume that too many people looked at those 196 minutes and didn't even give this beauty a chance. Aydin (Haluk Bilginer) is a former actor who now runs a small, picturesque hotel with his beautiful young wife Nihal (Melisa Sozen) and his recently divorced sister Necla (Demet Akbag), and his relationship with both of them is complicated to say the least. Despite his less than ideal circumstances with the family that surrounds him each day, Aydin still leads an enviable and idyllic life compared to those around him in the region. He is well educated, he is wealthy, and he admires the breathtaking landscapes that surround his hotel as he writes columns for the local newspaper and also assembles the research needed to write a book. Aydin is also the landlord for various citizens in the area and despite the tough economic times that surround him, he shows very little empathy for the less fortunate. He discusses his many charitable donations and likes to believe he is a man of the people, but when literally faced with someone who is struggling to avoid losing his home, he is quick to dismiss him claiming there is nothing he can do. Much like the hotel he owns and occupies, Aydin looks down on those below him. Winter Sleep is a film that is driven by incredibly written dialogue, as not a word feels wasted or irrelevant to the greater goal of the narrative. Some sequences are long and deeply personal, heated interactions between Aydin and Nihal or Aydin and Necla inside the hotel, and some may grow weary of the extended nature of these conversations but I was amazed at the way these actors working with such heartfelt, heavy material never skipped a beat. The ensemble as a whole delivers some of the finest work on screen of 2014, as these faces that were unknown to me prior to this film absolutely blew me away with their nuance, the subtle power they were able to deliver at every moment. Melisa Sozen as Nihal, the wife of Aydin who lives a seemingly blessed life without financial worry yet she wants more from existence, might be the strongest of the bunch. It was flat out impossible not to pay attention when she was on screen, as every look and expression and word demanded that I take notice. Many would dream to be Nihal yet she craves a feeling of independence that is impossible under that roof. She may reside up above the many struggling people nearby but just like them, she is looked down upon from the man who owns it all. When tears fall from her eyes, it was as if I too was experiencing the pain. Featuring gorgeous, lush cinematography and lighting that practically made me drool in delight, the snowy landscapes of the region were only a small portion of what makes Winter Sleep such a treat for the eyes. The frames that were really a joy to admire took place indoors, both inside the hotel and even the run down residence of the nearby struggling family in search of a way to avoid eviction. The flicker of a fireplace against their faces and the way it warms up a scene that is freezing cold in ways beyond what is influenced by weather is pure magic. Every aspect of this masterwork proved to be essential to the overall experience being pretty much perfect, and the final act features multiple moments that literally gave me chills. Winter Sleep is long but I never felt even the slightest drag, as I was sucked into this superb character study from beginning to end. I am just about ready to wrap up my 2014 cinematic calendar and put out my best of list, and what a brilliant way to close it up. Without a doubt, Winter Sleep will be found near the top. Very good review. I fully agree. Excellent movie. Thanks sgunes, I appreciate it! Glad you enjoyed this one as well!